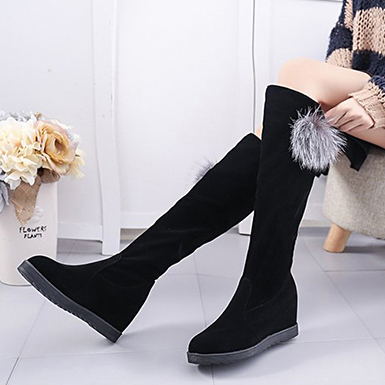 Jazz up your look in these women’s flat knee high boots. They feature a faux fur and rhinestone trim on one side to embellish an otherwise simple look. These boots were manufactured from our finest quality engineered suede, which looks and feels like genuine leather suede. However, ours is easier to maintain, and is 100% cruelty free. 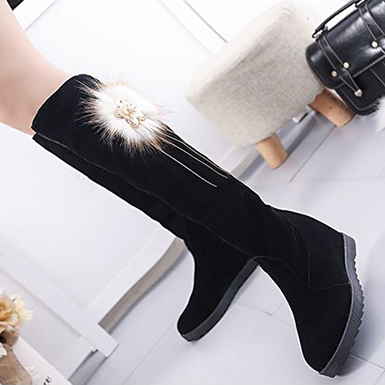 These boots feature rounded tows. The shaft extends to the mid knee, and has a tie in back to secure the fit. The soles are a high-grade synthetic material that is deeply treaded for extra traction. Their soft, rubbery quality cushions every step. The linings of these boots are made from a special textile that aids in keeping the feet warm and dry. 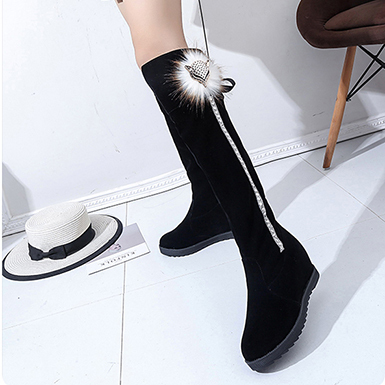 These boots look great with mini skirts. They come in classic black, charcoal gray and deep chocolate brown.